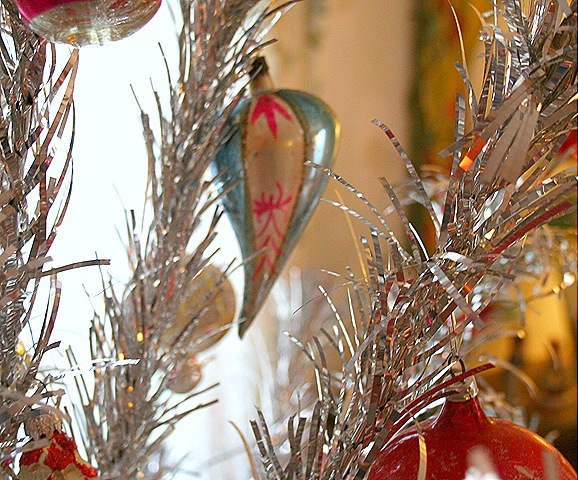 Everything about my aluminum christmas tree is old. The tree and it's rotating/musical stand were found at The Big Flea a few years back. 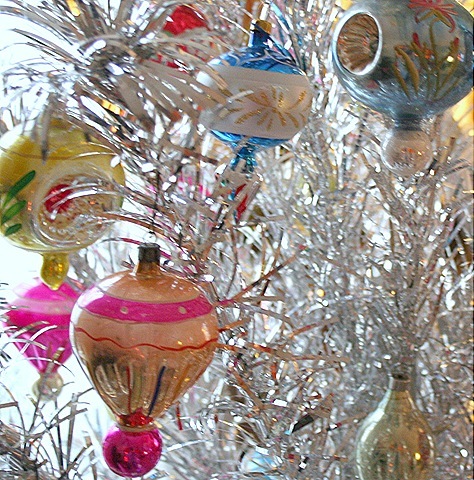 My most beautiful vintage ornaments go on this tree and I have 2-3 ornaments on every branch. I love the perfect "imperfection" of this one. My aluminum tree is my favorite tree. I've got 8 trees up and decorated this year. 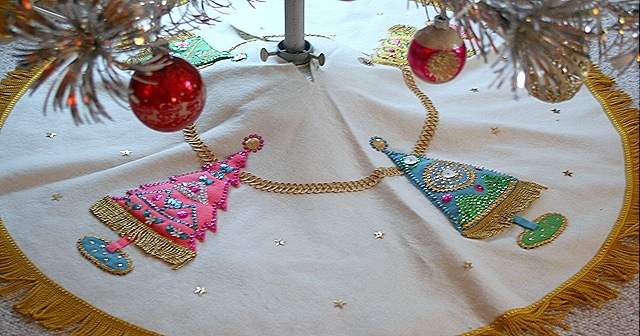 I also treasure all my felt/sequin christmas items. This tree has a gorgeous skirt that I found on eBay. Someone did perfect work on it. Now hop over to Vintage Christmas Monday at Joan's blog and follow the links to see what everyone else is posting for this week. Wow. THAT is a tree of beauty. ahhh. I could look at it all day. oh my gosh! I want to come see all eight!!! 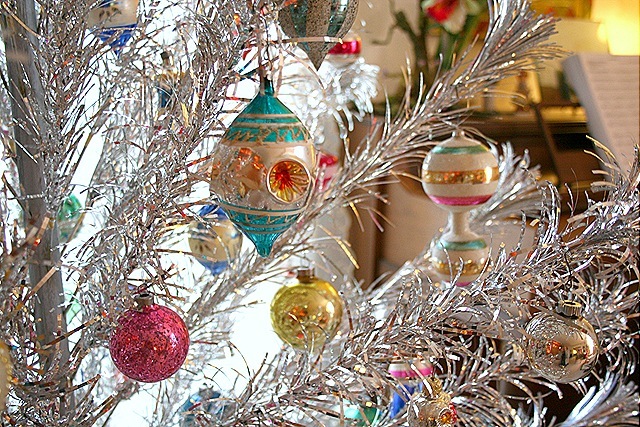 I want to put up an aluminum tree so bad, but I know my family would rebel against it! Yours is so pretty with all of those vintage ornaments on it. Can we please see all eight trees?!! Suzy, you have the prettiest vintage ornaments I’ve ever seen. 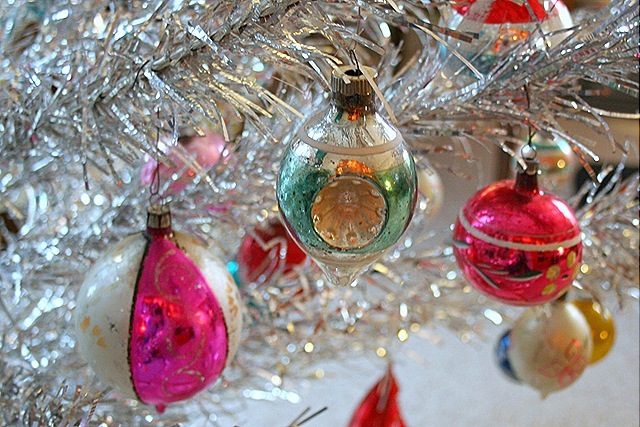 Your tree is truly a blast from the past! Wait. Did you say 8 trees? My head just spun around. That aluminium one is just too too gorgeous. I found one once, still in the box, in a smelly basement. It felt like too much work to put it all together so I sold it. I will never, ever forgive myself. Eight Trees? OMG! and I thought I was doing well to get one together. That’s amazing! This is a stunning tree. 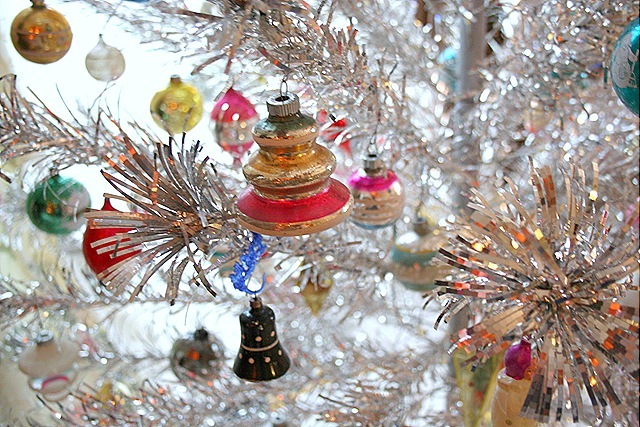 Love all the ornaments hanging on the silver branches. That loud noise was me falling off my chair, in a swoon. That is a wonderful, wonderful tree. The skirt is perfect. Eager to see the other seven! 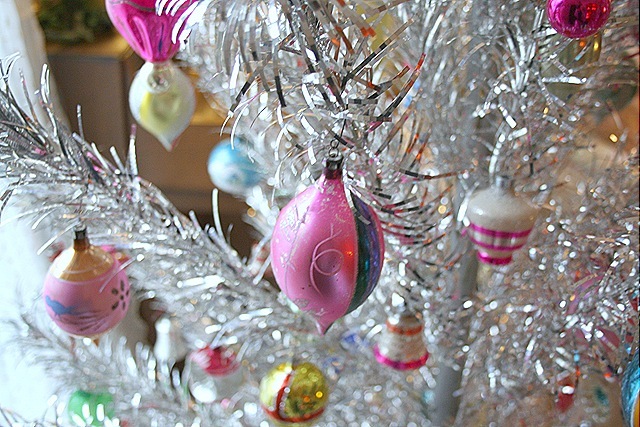 I love the way this tree looks with your vintage ornaments and tree skirt. The ornaments are so much easier to see than when they are on an evergreen tree. I love your aluminum tree. I have one as well that I display proudly just like you. This is the only kind of tree that I had as a kid because I was allergic to real trees and there were few alternatives. 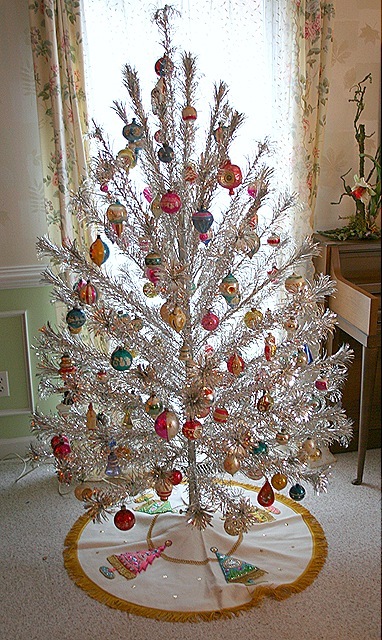 BUT the aluminum tree has always been FABULOUS in my book. Also wanted to let you know I am still enjoying the jewelry bag that I purchased from you a couple of months ago. It too is FABULOUS. Oh my goodness, it looks like something out of a magazine, it is stunning! Wow, that brings back great memories!